Corn — the perfect plant, the perfect grain. Oh, those green-sheathed ears on their tall stalks, silk tassels waving! Harvest, then husk, revealing the sweet nubs of Early Golden Bantam, Seneca, or Peaches and Cream. Eating the cobs simply with butter and salt, hands-on, is the way to go — no way you can tire of this. Again, perfect. Although, when did perfection ever stop anyone from tinkering? Even the Mayans fooled around until they came up with the idea of polenta. And lasting power? Unbelievably, some 3,500 years later, this poor man’s dish has come into favour once again. As have other cucina povera concoctions — tamales, timbales, enchiladas, succotash, fritters, chowder, corn cakes, and corn pone. Not to mention those 20th-century inventions: corn dogs, corn flakes, and corn chips. Lately, Ottawa’s fresh look at the cooking from Mexico and the American Deep South has meant we can now, in restaurants, find such gems as octopus tacos, charred corn tomatillo salsa, and skillet cornbread. (Even sweet corn ice cream, we hear.) Any way we do it, though, isn’t corn the perfect fall food? There are fries, and there are fries. Then there are polenta fries. 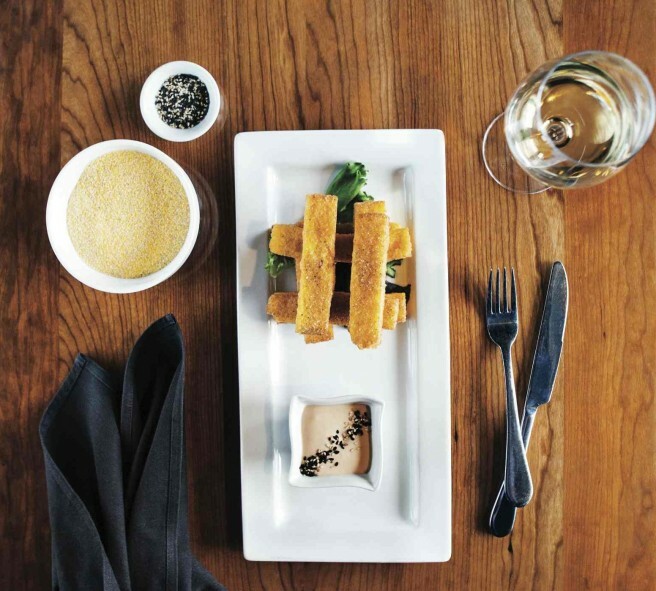 As ZenKitchen owner David Loan tells the story: “The kitchen staff love to experiment. One day someone wondered, ‘Hey, what happens if we make fries with our polenta?’” Life hasn’t been the same since. Even those who normally shun polenta can get behind these thick-cut fellas — crunch, crunch outside; creamy in. Served hot. On the side is Zen’s zippy chipotle mayo, rich and with deep flavour (not bad for a tofu-based dip). 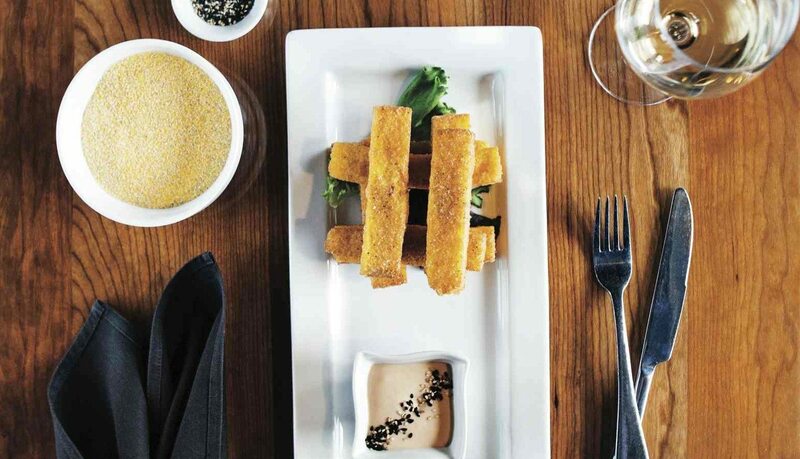 Some might even say these polenta fries go one better than the regular. We’d have to agree. ZenKitchen, 634 Somerset St. W., 613-233-6404. Hominy grits. Sound beyond the pale? Yes, but just try Chris Lord’s version — he’s co-owner and chef at Union Local 613. You’ll definitely become a hominy addict. Grits mean processing corn grains with an alkali, similar to the original Cherokee way, to release all nutrients. End result? Small, dense, dumpling-like nuggets. Lord’s secret is simply to cook, stirring, for many, many hours; add milk, cheddar, and roasted garlic; then grill the dish to form a golden skin. Like mac ’n’ cheese, except way, way better. Union Local 613, 315 Somerset St. W., 613-231-1010. Look up the word “velvet” in the dictionary. There’s sweet corn chicken soup. No, really. A Cantonese classic that made it onto the menus of Chinese-North American restaurants — and stuck. Some might call it bland. But we’re craving this creamy hominess, for real. At Mekong, owner and chef Dennis Luc used to make the soup with crab, but turns out that Ottawans prefer the familiar chicken. Otherwise, the dish is simply made with corn, half creamed, and chicken broth. A fine strain of beaten egg slowly streamed in at the last minute says pure silk. Mekong Asian Cuisine, 637 Somerset St. W., 613-237-7717.